A team of scientists from Royal Holloway, University of London, the Royal Veterinary College and the Hawk Conservancy Trust have discovered Secretary Birds can kick with 195 Newtons, which is equivalent to five times their own body weight, when they attack and kill their prey. And the contact time between the bird's feet and the snake is delivered extremely quickly - on average just 15 milliseconds. The study, published today (25 January) in the journal Current Biology, focuses on a captive male Secretary Bird called Madeleine, held at the Hawk Conservancy Trust, Hampshire. Madeleine was trained to attack a rubber snake to demonstrate the hunting techniques of this type of bird. The scientists measured Madeleine's kicks by putting a force plate (hidden under artificial grass) in the bird's enclosure and pulling the rubber snake across the force plate. As Secretary Birds hunt venomous snakes, a missed strike could have deadly consequences so the birds are capable of delivering fast, forceful and accurate foot strikes that are sufficient to stun and kill prey. Dr Steve Portugal from the School of Biological Sciences at Royal Holloway, University of London, said: "The exceptionally rapid strike contact duration is 1/10th of the time it takes to blink an eye – which takes around 150 ms.
"Such rapid time, coupled with the exceptionally long legs, means the birds can't be using proprioreception – the sixth sense we use to sense our position and movement. Therefore, they are using visual targeting and feed-forward motor control – (pre-planned movements) - during strike events. This means the birds can only correct for a missed strike in the next kick – once they've started a kick, they can't adapt it, and they have to wait for the next strike." Dr Monica Daley, a Senior Lecturer at the Royal Veterinary College, explains: "There are interesting potential technological applications in 'biologically inspired' control of exceptionally fast movement in robots and prosthetics. A comparable task might be playing baseball with a prosthetic arm, which requires very fast, forceful and accurate arm movements for pitching and batting." 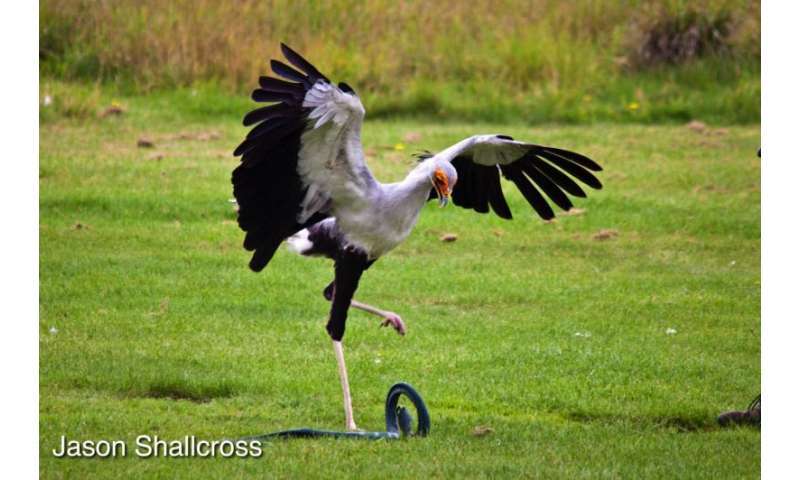 Dr Daley, adds: "Despite their very unusual appearance with exceptionally long legs, the secretary bird's striding gait is remarkably similar to of ground birds such as pheasants, turkeys and ostriches. This suggest that specialisation for their remarkable kick-hunting technique has not unduly compromised their locomotor abilities."